SHOP SMART: We recommend that you seek the advice of a qualified professional for your health concerns. 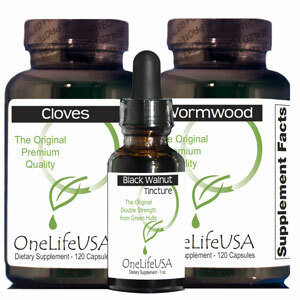 If you, with guidance from your health care professional, decide Dr. Clark´s protocol would be beneficial for you, we hope OneLifeUSA is your source for this kit. Your business is appreciated and your satisfaction is important to us. This was not only Dr. Clark&apos;s first clinically used cleanse, but she also considered it her most trusted version. Dr. Clark personally came to our lab to set up the manufacturing of these products to insure that the raw materials and finished products met her strict specifications. This kit features her three original products: Wormwood- 120 caps (no Quassia or Male Fern additives), Cloves - 120 caps (pure, fresh ground) and Black Walnut Tincture (extra strength made form GREEN hulls). Each kit contains enough product to compete one protocol plus one maintenance cycle. There are NO flow agents used in these products. Years ago Dr. Clark&apos;s research indicated a connection between gut health and overall health. Through her studies she concluded that an unbalanced gut flora or one with too many harmful microorganisms had a negative impact on one&apos;s health and risk of disease. At the time her study results were published, conventional medicine did not agree with her findings. As time has passed and scientific studies have progressed, it&apos;s clear that Dr. Clark may have been on the right track. Now, in the 21st century the understanding regarding disease has rendered many of the old ways of defining health conditions (based solely on symptoms) as not always particularly useful or correct. Instead, learning to understand that the origins of health issues and the way the body operates as one, whole, integrated ecosystem, can mean that symptoms appearing in one area of the body may be caused by imbalances in an entirely different area. As it is becoming understood there is a strong relationship between the gut and the immune system as well as the gut and the brain. Therefore, addressing the health and balance of gut flora has the potential benefit of alleviating symptoms throughout the body. As this type of research continues the direct link between gut flora and health issues is certain to grow. Most experts in this area of study feel that we haven&apos;t even begun to scratch the surface in regards to direct links between imbalances in the gut and a host of health issues. SHOP SMART: Perhaps one the most common questions I am asked is: How did we select the ingredients for this kit? We didn´t. This kit is based solely on the research and recommendations of Dr. H. Clark. We were quite fortunate to have Dr. Clark personally come to our lab and work directly with us. Her input insured these products were made according to her strict standards and that the final results met her specifications. Dr. Clark´s published books are quite comprehensive and provide hundreds of case studies. It is understood that the results from her studies represent only her study participants, and cannot be expected for everyone.